Upright freezers are increasingly becoming the popular freezer option. Owing to their upright configuration, they occupy a much smaller floor area so have a much smaller foot print than similarly sized chest freezers . Their drawers and shelves make food organization a lot easier, as well as allow quicker and easier access to food. Most freezer uprights are frost free and this eliminates the tedium associated with manually defrosting a freezer. The uprights on the market today cater to a wide range of feature preferences. Or you can shop by brand with Frigidaire, Kenmore, GE, Whirlpool, Maytag, Danby and LG leading the pack. Or you can browse our freezers by size with everything from compact, small, to large. If you are keen to keep a tight rein on your electric bill, checking out the range of energy star rated upright freezers is probably time well-spent. If price is a major determining factor, we suggest you look at the deals we have put together for you. Remember that you can save quite a lot of money just by buying from stores that offer free shipping. If you prefer to buy from a particular store either because of their loyalty program or unparalleled customer service, then we suggest you take a good look at the freezers whose orders will be fulfilled by your favorite store. This is a comprehensive list and includes giants that we have come to know and trust such as Sears, Walmart, Amazon, Home Depot, Lowes, Best Buy, ABC Warehouse and Kmart. Read on for details on each of these attributes. The freezer uprights on the market today cater to a wide range of feature preferences. These features include frost free (automatic defrost), a built in ice maker and dispenser, manual defrost, lock and key, door alarm, and quiet operation. A buying decision could also hinge on whether the freezer you are considering has coil shelves or even a reversible door! To get the best return on investment, be sure to explore the freezers whose feature set is most important to you. Do Brands Matter To You? But these are times of fast-paced innovation and many more brands have made it to the highest echelons in the upright freezer world. The leading names include GE, Kenmore, Whirlpool, LG, Haier, Bosch, Beko, Sub Zero and Zanussi. So, which brand tickles your fancy? There are several reasons demand for energy efficient upright freezers is increasing. The first is that these freezers are associated with appreciably lower electric bills and as the old maxim “a penny saved is a penny earned” rings especially true. Second and as a result of this energy efficiency, you are able to play your role in reducing pollution and its effects on climate change (this is real, right?). In other words, these appliances consume far less energy than their identically sized counterparts. So if you are in the market for an energy efficient freezer upright, be sure to check out our primer on Energy Star upright freezers. In the realm of upright freezers, one size simply doesn’t fit all. In fact, these appliances come in different sizes. At the broad level, they can be compact, small or large. Or those who live in dorms and small apartments. 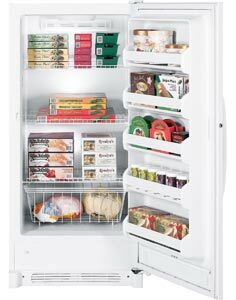 ﻿﻿And speaking of compact freezers, the Whynter 2.1 Cubic Feet Energy Star Upright Freezer﻿ tops the charts in this size and if you are not able to find it at a competitive price at your local store, be sure to check it out at Amazon.com. Large freezer uprights are great investments for large families as they enable them to shop and cook in bulk, saving them lots of money and precious time. You’ll find everything from 3.0 cubic foot upright, to 3.1, 3.5, 4.0, 4.2, 4.6, 5.0, 5.1, 6.0, 6.5, 6.9, 7.0, 7.5, 8.0, 8.2, 8.8 and 9.0 Cu Ft freezer uprights. Larger freezers in this configuration have capacities of 10.0 Cu Ft, 11.0, 12.0, 13.0, 13.7, 15, 19, 20, 20.6, 21, 24 and 25 cubic feet. What Freezer Color Matches Your Kitchen Décor? Back in the day, freezers were almost always white. It is a great color that can’t stand dirt and it gives many kitchens a clean look and feel. Now though, the good old white upright freezer is sharing the stage with its stainless steel, silver and black counterparts. Fingerprint resistant stainless steel uprights are generally regarded as sleek and upscale, and cost top dollar. And, there is no doubt that a black freezer will blend in best in a kitchen with dark décor. Plus, a black freezer doesn’t easily become dirty or show smudges. If you are looking for some amazing bargains, remember you can pick up some incredible online deals on freezers. All provide excellent opportunities to pick up freezer uprights at unbelievable sale prices. Most stores also offer generous discount coupons that are valid over these holidays so you get to pay low, low prices. But if you are looking to buy a cheap freezer, you can don’t have to anxiously wait for these holidays or Valentine’s Day, Mothers' Day or Fathers' Day. As freezers are generally bulky appliances, they tend to attract significant delivery charges. So imagine how much you can save just by cashing in on a free delivery offer. Plus, you can pick up jaw dropping bargains on last season’s cast off from a range of overstock retailers. Partial To A Particular Store? Does it seem like a freezer works better and lasts longer only when bought from a particular store? This may well be due to loyalty rewards, a seamless ordering process, exemplary customer service or because we trust the quality of the brands that that store chooses to stock. You’ll be pleased to learn that each of these has a wide range of upright freezers ready and waiting for you. Which Is The Best Freezer Upright? Well, the term "best" is relative and which freezer best suits your needs depends on the attribute set that best appeals to you. So over to you, please share what your best brand and model are and the reasons for your choice. We’d love to hear from you on what your best upright freezer is.